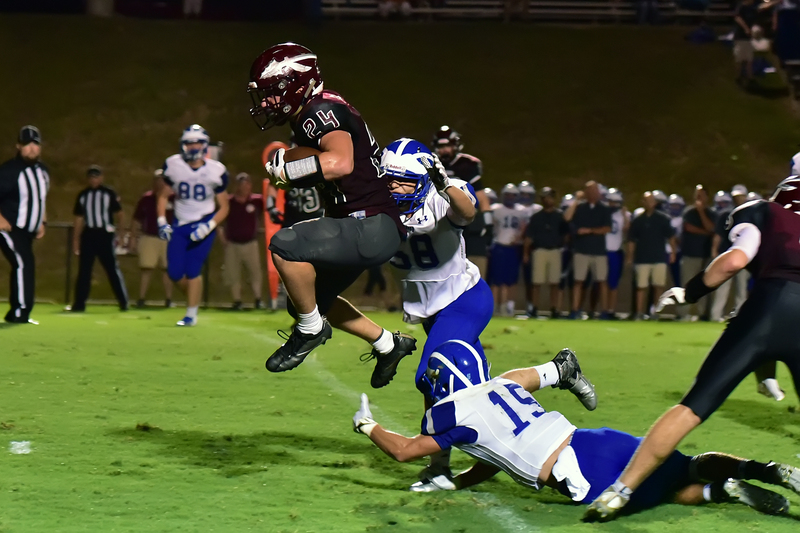 WEST POINT – After starting the season with a big win over a rival Fairview last week, the West Point Warriors (Class 5A, Region 7) welcomed the Arab Knights (Class 5A, Region 8) for a matchup that featured a huge Warriors comeback. Arab received the opening kick, and after an incomplete pass on the first play at the 35 and a penalty against West Point, the Knights started strong with their first touchdown coming within the next few plays. Their 2-point conversion was unsuccessful, and a pass was intercepted by West Point’s Levi Farley on their next possession. Senior running back Hunter Persall scored in the first quarter to give West Point a 7-6 lead going into the second quarter after the extra point. The game was full of interceptions on both sides; Arab intercepting a West Point pass in the end zone. Arab scored three more times during the second quarter, and a successful 2-point conversion by the Knights with three seconds left on the clock gave the Arab a 26-7 lead at the half. It was the last time the Knights’ offense would find the end zone. West Point began to fight back during the third quarter when Persall collected 47 yards and a touchdown on five carries and one catch. West Point’s Rylan Jones also scored in the third quarter to make the score 26-13, Arab. With the clock ticking down in the final quarter, West Point felt the pressure when the Warriors fumbled on the first play, leaving Arab to recover it. However, Persall picked up the slack for the Warriors in the fourth and scored two more touchdowns for a total of 48 yards in the quarter. Persall led West Point to victory when he ran in the game-tying touchdown with only 51 seconds left on the clock. A successful 2-point conversion gave West Point the 27-26 come-from-behind win.